Agile development methodologies are experiencing rapid adoption across industries as software organizations embrace the key themes of streamlining processes, tighter integration between development and test, and strong emphasis of continuous delivery of working software. However, as organizations embrace various new agile practices, individual development teams often don't have the visibility into broader, measurable business values, and where their contributions fit in. 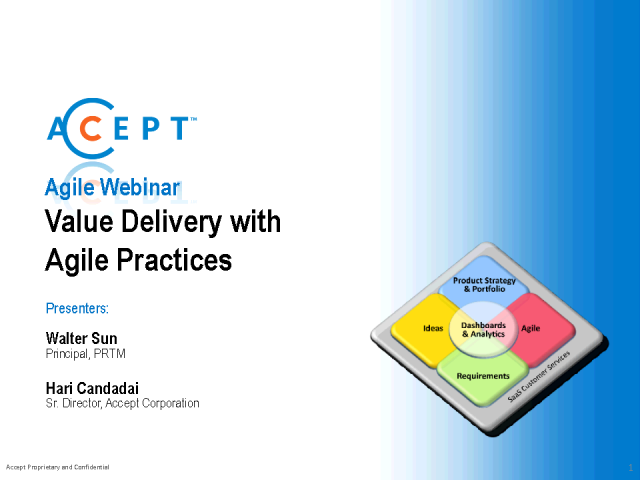 Walter Sun, Principle at PRTM, will share how agile development teams can ensure they are value delivery-focused and how organizations can avoid the common challenges of agile adoption. Walter Sun, Principle at PRTM, a leader in Management Consultancy, has been instrumental in successfully guiding Agile teams in many of world’s largest technology organizations to drive growth, boost profits, and set new standards for market leadership.